Over the years we have made many attempts to juice on a regular basis. All have ended in a matter of days because making the juice is such a hassle. Last month, my friend who is moving, offered me her extra NutriBullet, I almost said no. Then I decided “what the hell!” The price was right and besides I was curious to see if the hype about how wonderful it is was real. So, I took it in spite of my deep skepticism about if I would use or like it. I brought it home and started to use it. After a month of using it twice a day, I am a believer! 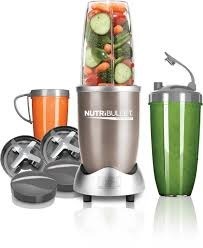 It is easy to use, easy to clean and (once you get the hang of it) makes great juices and smoothies. The best part is that getting juice this way is cheap! I use about 20% of the ingredients that I used for the same amount of juice. And I don’t get a blood sugar rush since the Nutribullet uses the whole fruit or veggie and leaves the fiber in the drink. Our morning drink is vegetable based. I have used various combinations of organic avocados, carrots, celery, bell peppers, kale, spinach, cucumber, tomatoes and bok choy. I usually add chia or hemp seeds for protein. The afternoon drink is fruit based. I have experimented with combinations of kefir, coconut water, ground cinnamon, vanilla, frozen organic fruit, and fresh organic bananas, papaya, apples and kiwi. I usually add chia seeds, nuts or nut butter to add protein. From start to finish – clean up and all is less than 5 minutes. The result is creamy, filling and satisfying. We are just learning how to use this so there are more experiments in the making. Will update you as we learn more! This entry was posted in fresh veggies, juice, Whole Food Plant-Based nutrition. Bookmark the permalink.